Goiter is a Thyroid Disease. Enlargement of thyroid gland irrespective of its pathology, is called goiter. Thyroid gland is located in the neck, below the adam's apple (bony prominence in the neck, more porminent in males) and in front of the trachea. Enlargement of thyroid gland causes a prominent (or slightly or non prominent) bulge in the neck. 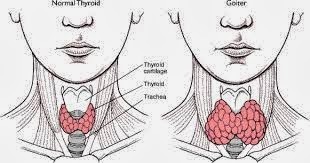 Goitre is a term that refers to an enlargement of the thyroid (thyromegaly) and can be associated with a thyroid gland that is functioning properly or not. Worldwide, over 90.54% cases of goitre are caused by iodine deficiency. Goitre which is associated with hypothyroidism or hyperthyroidism may be present with symptoms of the underlying disorder. 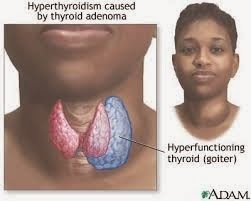 For hyperthyroidism, the most common symptoms are weight loss despite increased appetite, and heat intolerance. However, these symptoms are often nonspecific and hard to diagnose. Following conditions lead to enlargement of thyroid gland and goiter formation. 1. Non Toxic (Simple) Goiter.